The winners of the FAMAS Awards 2013 were announced in a ceremony held at the AFP Theater in Camp Aguinaldo, Quezon City on Sunday night, April 21. The biggest winner of the night was the Gen. Emilio Aguinaldo biopic, "El Presidente," which swept all the technical awards and bagged the Best Picture, Best Director (Mark Meily), Best Actor (ER Ejercito) and Best Supporting Actor (Cesar Montano) awards. The Best Actress went to Kapamilya star Angel Locsin for her role in the MMFF entry, "One More Try," while veteran actress Jacklyn Jose took home the Best Supporting Actress trophy. The FAMAS Awards are being handed out annually by the Filipino Academy of Movie Arts and Sciences and honor excellence in acting and filmmaking during the past year. It is now on its 61st year. 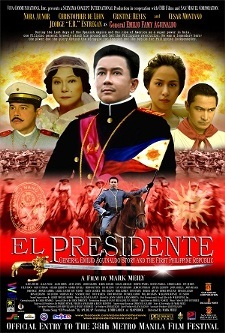 Best Director: Mark Meily, "El Presidente"
Best Actress: Angel Locsin, "One More Try"
Best Actor: ER Ejercito, "El Presidente"
Best Supporting Actress: Jacklyn Jose, "A Secret Affair"
Best Child Actress: Barbara Miguel, "Migrante"
Best Child Actor: Miguel Vergara, "One More Try"
Best Sound and Musical Score: "El Presidente"
Best Original Theme S0ng: "El Presid3nte"
Best Production Design: "El Presidente"
Best Special Effects: "El Presidente"
Advocay Film Award: 'Larong Bata"